Hello Ladies! How was your weekend? I took full advantage of the extra long weekend to shop, soak in some sun, catch up on blog work, and hang out with friends. I crammed in as much fun as possible. My favorite sale purchase is probably these shoes. They are perfect for Spring and Summer! I love the slightly lower than my normal heel on them to wear to outdoor events. My off the shoulder love continues with this striped ruffle top. The stripes on this are navy and white, sometimes they look black depending on the lighting. I love this top for date night, happy hour, or girls’ night out. 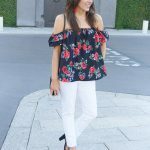 I wore this ruffle off the shoulder top out a few weeks ago with distressed jeans (seen here) for a casual happy hour with my girlfriends. I love that it can be easily dressed up or down. Also, it looks gorgeous with white jeans for a dressy daytime look. It also comes with a strap to wrap around the waist, but I prefer it loose and flowy. Also, these double hoop earrings are my latest jewelry obsession. I have them in constant rotation for both work and weekends. I love the unique double hoop and the delicate simple style. The simplicity makes them work well with so many different outfits. Bonus, these earrings are only $10! I hope you guys have a great rest of the day. 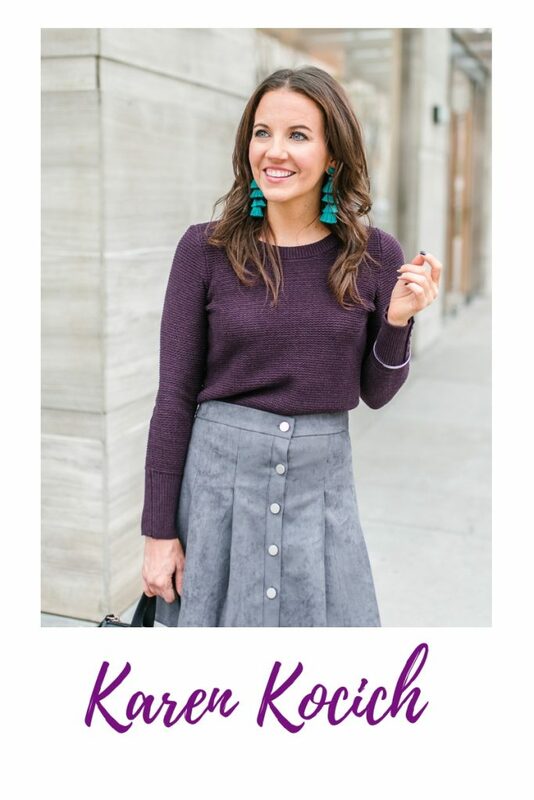 Thanks for stopping by and don’t forget to scroll down and check out the Style Link Up for more fabulous outfit inspiration! I love the striped OTS top and purple clutch! Thanks for hosting! Those earrings are so neat! I can see how they would go with everything. Such a beautiful outfit with this great off shoulder striped top! Still fan of these block heel sandals and the mules you purchased this weekend are fabulous! Can’t wait to see a look with them! This is a really classy chic look! I love the color the bag brings to the look! I love the double ruffles on this striped top! So frilly and fun! Your purple clutch is nice pop of color and it’s just a beauty all on its own. Happy Tuesday and wishing a fabulous week ahead! The shoes were an awesome sale find and loving the chic stripes on this top! I adore the hoops too. So glad you enjoyed your weekend and thanks for the link up!